How can one man convince the highest powers in Washington that the President of the United States is dangerously unstable—before it’s too late? Senator Jim MacVeagh is proud to serve his country—and his president, Mark Hollenbach, who has a near-spotless reputation as the vibrant, charismatic leader of MacVeagh’s party and the nation. When Hollenbach begins taking MacVeagh into his confidence, the young senator knows that his star is on the rise. 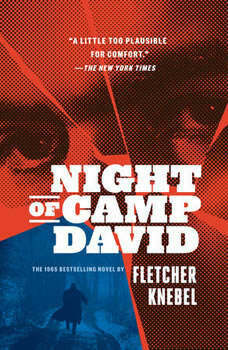 But then Hollenbach starts summoning MacVeagh in the middle of the night to Camp David. There, the president sits in the dark and rants about his enemies, unfurling insane theories about all the people he says are conspiring against him. They would do anything, President Hollenbach tells the stunned senator, to stop him from setting in motion the grand, unprecedented plans he has to make America a great world power once again. MacVeagh comes away from these meetings increasingly convinced that the man he once admired has lost his mind. But what can he do? Who can he tell?